# Fordable keyboard with numeric keypad included. # Material: made by high quality silicone, non poisonous and evil. # Anti-pollution: its all sealed completely, preventing any kinds of germs and pollutant into the keyboard. # Water proof: its surface is water-proof and washable, can be used even inside shallow water. # Acid and alkaline proof: it can be used safely even in an acid or alkaline environment. # High dust proof. # Carrying convenience: can be rolled up and save place while carrying. 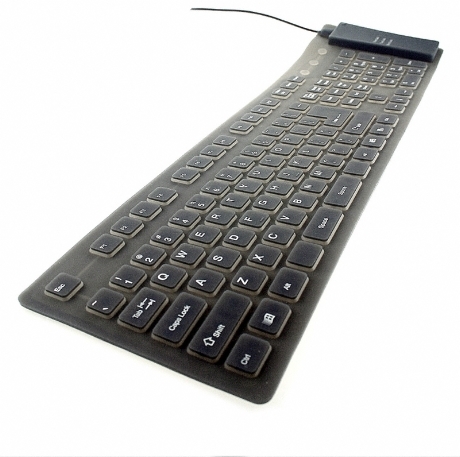 # Special printing technology: guarantees the letter on the buttons of the keyboard not to be worn way for a longtime. # Its applicable to office, hospital, classroom, workshops, network, bar, etc.